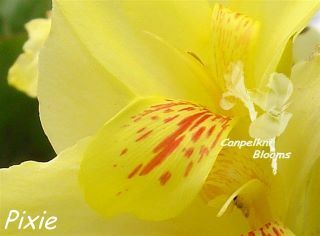 The Yellow Cannas that I grow, well here they are, all the pictures below have yellow as the base color and there are more that are bi-colored with yellow in them, here I will cover the cannas where yellow only makes up the most of the base color. 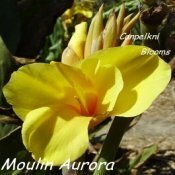 Have any yellow colored cannas in your garden? 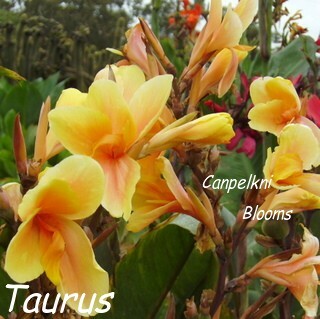 We'd love to see your yellow flowering cannas. Click here to share the one's you grow! Some of the them have flowers that are rich and sunny while others are more soft and paler in color. 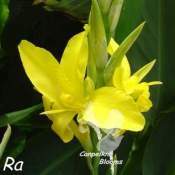 Yellow canna names and heights, short growing varieties are up to one meter, medium is from above one to two meters and tall cannas are listed as above two meters. These heights are measured from the ground to the top of the flowers. You can visit each cultivator whose name is underlined below for pictures and full descriptions about that particular plant. 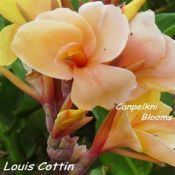 Canna Louis Cottin, short at 0.80cm, copper yellow to apricot, colored foliage. 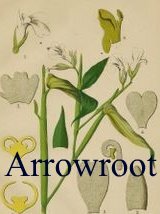 Aquatic Canna Ra, medium at 1.7 meters tall, blue green foliage. Canna Jarluigi, medium at 1.2, green foliage. Canna Moulin Aurora, medium at 1.2, colored foliage. 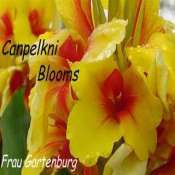 Canna Frau Gartenburg, medium at 1.6, green foliage. 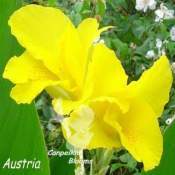 Canna Austria, medium at 1.6 meters tall, green foliage. 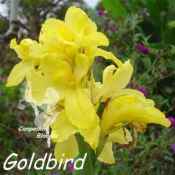 Canna Goldbird, medium height at 1.3 meters, green foliage. 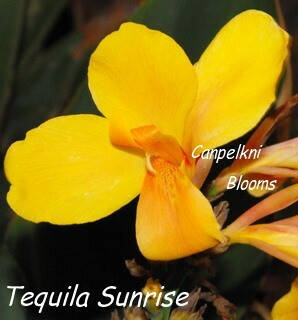 Canna Tequila Sunrise, medium at 1.2, green foliage. Canna Taurus, medium at 1.2, colored foliage. 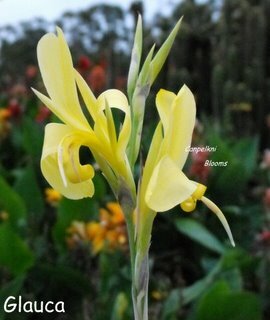 Species canna Glauca, grows up to 1.5 meters tall, slender glaucous blue green foliage. 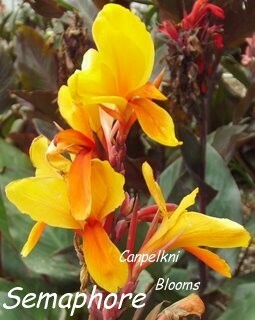 Canna Ebpapei, medium at 1.3, green foliage. 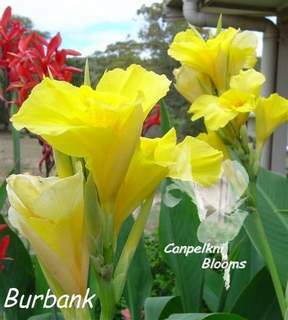 Canna Burbank, medium at 1.9 meters, green foliage. Canna Pixie, shorter medium 1.1, green foliage. 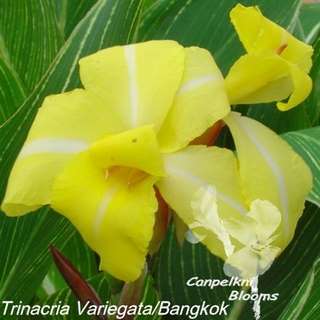 Yellow cannas Semaphore, medium height, colored foliage. Canna Uturae, medium height at 1.9 meters, green foliage. Canna Trinaciria Variegata, medium at 1.4, variegated, yellow striped white flower. 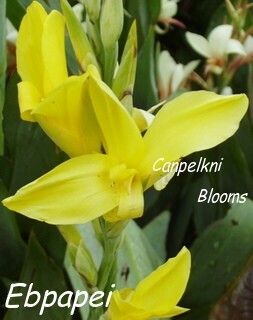 Beautiful Yellow Garden Cannas at Your Place? Write About It Here! 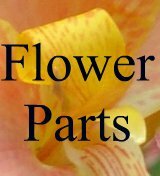 Do you have any Yellow Garden Cannas growing in your Garden?" how long do they flower?" how tall do they grow?" 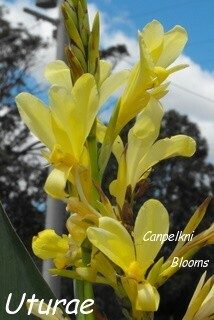 are some yellows better than others, which is your favourite Yellow Flowering Canna? 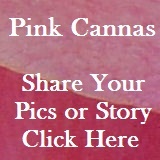 Share your story, tip or photos about any Yellow Cannas that you have growing in your garden. 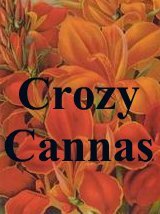 Click on the links below to see some great reviews about Gardening with Cannas and how they have been used. They were all written by other visitors to this page. WHO IS THIS SHORT LADY? 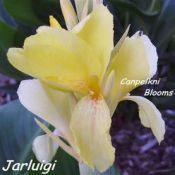 Other yellow that are spotted cannas iclude Austra, C. F. Cole, Colibri, Elizabeth Hoss, En Avant, Florence Vaughan, Gem and another I have as the Gem form 2, Giselle, Jarhondarh, M. Holtz, Richard Wallace 2, Rosemund Coles, and the dwarf growing Tropical Yellow.